Chemistry students at The Sixth Form College, Solihull journeyed to London last week to visit the National History Museum and the Royal Society Summer Science Exhibition. First year Chemistry students went on the trip to celebrate the science being exhibited at the 2018 show. This included 22 exhibits showcasing some of the best research being done across the UK and including the scientists themselves to talk to the students about their research. Topics of research included working to find a vaccine for malaria, exploring the Universe with the Webb Telescope, nanotechnology, neutrino particles, radiation and cancer treatments and using biomaterials for bone repairs. Students also attended a talk called “Science’s Greatest Failures”, which explored achievements borne out of failures and the need to persevere, a resilience that students must also develop. While in London, the students also examined the life and earth science specimens on display at the National History Museum. The museum’s collection comprising approximately 80 million items, including exhibits on botany, entomology, mineralogy, palaeontology and zoology. The museum is a centre of research specialising in taxonomy, identification and conservation. 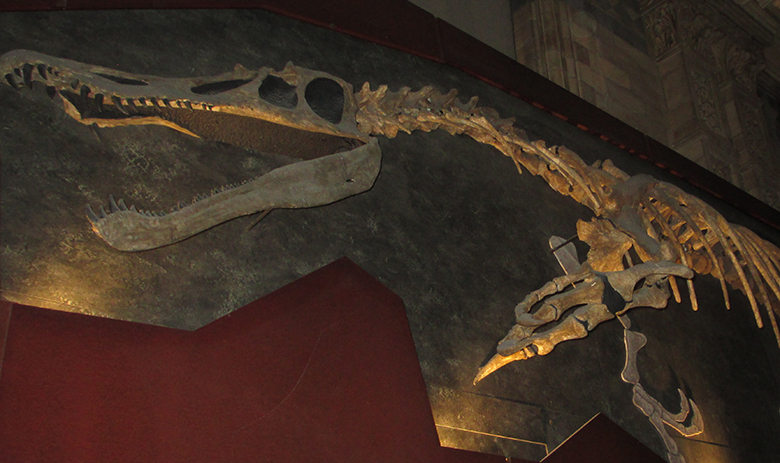 The museum is particularly famous for its exhibition of dinosaur skeletons, although “Dippy”, the large Diplodocus cast that once dominated the entrance to the museum is on tour and currently housed in Birmingham’s Museum and Art Gallery. Instead, the skeleton of a blue whale is now hanging from the ceiling at the main entrance.